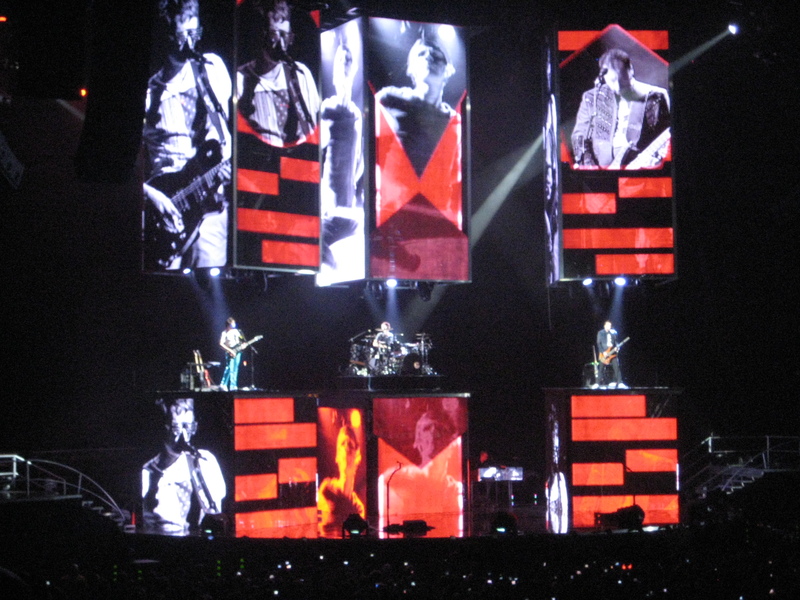 Muse are the masters of modern arena rock. This three-piece from Devon, England embody rock bombast. The stage show for their current US tour is the very opposite of subdued and intimate, with huge screens, a projected visual accompaniment for each song, raising and lowering platforms, crazy lights, huge balloons that look like eyeballs, a plexiglass grand piano, and frickin’ lasers…my god, the lasers. Tour manager: So, how many lasers do you lads want for this tour? Muse: Is “all” a number? Yes, all… All the lasers. Guitarist/vocalist Matt Bellamy owned the nearly sold-out show. He seems to be single-handedly bringing back the concept of a guitar god, with a command of the instrument and a penchant for spontaneous growls and squeals that set him apart from his rock guitar peers. Bassist Chris Wolstenholme (a personal hero of mine) holds down a solid low end, accounting for the bulk of the band’s signature sound by using distortion and synth effects to add dynamics to a sadly underappreciated instrument. Dominic Howard beats the drums like they insulted his mama, maintaining a precise tempo in order to sync up with the visual accompaniment and carry the songs through their phases. The word “tight” is an understatement. In my opinion, the band’s best material comes from 2003’s Absolution and 2006’s Black Holes & Revelations. In Cincinnati, the song selection from those LPs did not disappoint. Tracks from the former included the synth-bass groove “Time Is Running Out,” the head-bangin’ “Stockholm Syndrome,” and (my personal favorite) the raucous “Hysteria” with its distorted opening riff and shout-along chorus. (Check out the 5-minute mark of the “Stockholm Syndrome” clip to see Bellamy call the aforementioned “audible” and engage in some guitar badassery.) Tracks from Black Holes & Revelations included (another personal favorite) “Starlight” and (surprisingly) “Map of the Problematique,” whose 80’s-goth-throwback vibe has not been a live staple for quite some time. One of the last songs of the night was “Knights of Cydonia,” an up-tempo rocker with an epic refrain. This song is always a crowd pleaser and the band knows how to make the most of its best features. I think lights must have been dimming for a five-block radius when they turned on all the lasers, lights, and mist machines at the end of this number. The amperage for a show like this must be staggering. On the way out of the venue, I caught sight of four tour buses and eight (!) tractor-trailers used to haul the band and their stage gear. Now that’s rock n’ roll. Muse really are at the top of their game. They are absolute huge in Europe, selling out Wembley stadium two nights in a row in 2008 for their HAARP live CD/DVD, as well as large venues all over the world. It’s good to see them filling arenas here in the States as well. With enough energy for a dozen hard rock bands and a touch of theatricality, they provide a thoroughly enjoyable spectacle. Their remaining tour dates for 2010 can be found here. Photos from March’s show in Nashville can be viewed at my Flickr account. Awwww man. I wish you’d hadn’t been running late. Metric is a Canadian band and they’re really phenomenal (and on their way). Saw them three years ago — pre-Twilight plug and Muse opener — and they’ve only gotten better. Check out two albums by them: “Old World Underground, Where Are You Now?” and “Live It Out.” You won’t be disappointed. Really good stuff. I dunno man. I did some YouTube investigating of Metric and didn’t really hear anything that blew my skirt up. Maybe I’ll give them another chance.